The most successful teams come together with open communication, trust, and shared values. Just as with family or friends, sharing a meal contributes to that. So, nothing new to report there. Building a cohesive team, one that is present, strong and positive, results in better performance and engagement. 70% of executives in an HBR study “rank employee engagement as very important to achieving organizational success.” In our experience, mindful teams – teams more aware of and attending to each other - solve problems together, communicate more clearly, set and achieve common goals, build trust and deal more effectively with challenge and change. What has food got to do with all that? One way to build a mindful team is through the preparation of food. According to Ben Dattner in the Harvard Business Review, cooking and eating a meal together builds a sense of interdependence and collaboration. “At some primitive level, people that we hunt or gather with, cook with and then eat with become our allies rather than our adversaries,” says Dattner. In the competitive, silo’d world of executive teams, every active step toward allies versus adversaries is a good step. It was only during the last half of the last century when the experience of sharing a meal together began to break down. Preparing and sharing a healthy meal together can instill feelings of trust, and increase communication and listening skills – and it doesn’t have to be hard. Mindfully fueling your team doesn’t have to be complicated and you wouldn’t likely do it every day. Preparing a meal isn’t something done every day. The “mindfully” aspect of fueling is also about smart choices that build and maintain energy during the day and good health all of the time. Certain snack foods may hold up in the bowl or vending machine for weeks, but the reason they do is the reason you should avoid them. Some of our ideas are found here. For the inevitable “working lunch,” periodically have one where the work is something other than the week’s priorities. Create a meal together at someone’s house as part of the annual goal setting process or year-end review meeting. Adopt a “lunch & learn” practice of hearing from an external expert on an agreed list of interesting topics each month. 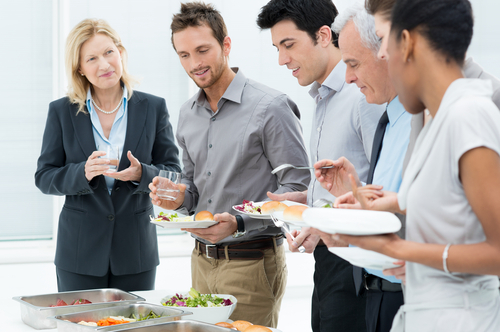 Have a byob (breakfast) meeting periodically - without the boss. Key point – if it’s optional and people opt out, it’s not a team experience. The meal itself does not require a commercial kitchen with lots of fancy equipment. With a little planning and communication with each other or a food vendor, you can arrange local, fresh produce and even precooked proteins with the equipment you may need (knives, bowls, cutting boards, etc.). Remember, this isn’t a cooking competition show – it’s a way to do something together that reinforces good teamwork. Another thing to remember – not everyone feels or thinks the same way about food. Just as being mindfully centered does not mean mandatory seated meditation for all, mindfully fueled does not mean the team dictates everyone’s diet. Mindfully Teaming is about familiarity and respect – so please enjoy that cookie and I’ll enjoy being with you as you do. We all must eat to live. Living mindfully fueled is not so much about doing new and different things as it is doing things we already do differently. Integrating mindful fueling with your team may feel different – but the difference is more likely to be how you think and feel about each other rather than how you think and feel about food. It is a great way to bring your team together, to provide the best fuel for the creativity, productivity and health that drives success. The information provided here is not meant to replace any information of treatment prescribed by a physician or other licensed health care practitioner. It is for your information only. Consult your doctor before beginning any new physical program. APP offers a highly engaging, skill-building one-day program for management teams in these practice areas as well as on-going support and coaching. Building competence, particularly for the personal safety and personal centeredness practices, would benefit from working with professionals like Anne and Chris. The increasing pace of change, increasing ambient stress, and demands of business and life are reasons “mindfulness” has become so popular. Magazines like Forbes and HBR now regularly post articles on meditation and mindfulness practices. Mindfulness resources are increasingly found in the workplace through benefits and on-site classes. And, as with all new things, there’s healthy debate about what it is and who it’s for, as read in Amy Jen Su’s article “If Mindfulness Makes you Uncomfortable, It’s Working.” If you’re one still wondering about if it’s a religion or cult or otherwise just weird, read Seth Gillihan’s mindfulness myth-buster in Psychology Today. So, how does mindfulness contribute to that sense of “we-ness” that fails under stress? We have written about the mindfulness benefits for teams that share an eating practice and fitness practice. But articles on “Centering” practices like Fast Company’s “The Business Case for Meditation" almost always show a picture of one centered person seated amidst the chaos. Since work and life happens mostly in teams, here are two of our five mindfully centered practices for teams. Setting intentions is increasingly a means to realize how you want to live or the impact you want to have. It’s an essential aspect of Buddhism and yoga and expands on goal setting to include a sense of why and the greater value. But anyone can set an intention for a day, a meeting, a debate, or sharing feedback. In his book, “The Buddha Walks Into The Office,” Lodro Rinzler gives a simple example, “My intention is to be a bit more patient with my co-workers.” Intentions can be of deep resolve and they can be of simple steps – for individuals and teams. Setting intentions can also be a powerfully guiding group effort. Mindfully centered teams don’t have meetings where people ask, “Why are we here?” Starting a meeting with a stated intention provides focus and makes plain the intent behind the goal. When a person sharing feedback states their intention in sharing it, it can open the ears of the receiver. Simpler than Mission, Purpose, Vision or Values, a consistent intention-setting practice can optimize a team’s efficiency and effectiveness on a daily basis. The three-part yogic breath is a simple practice that grounds attention at the base and expands to fill both body and mind. 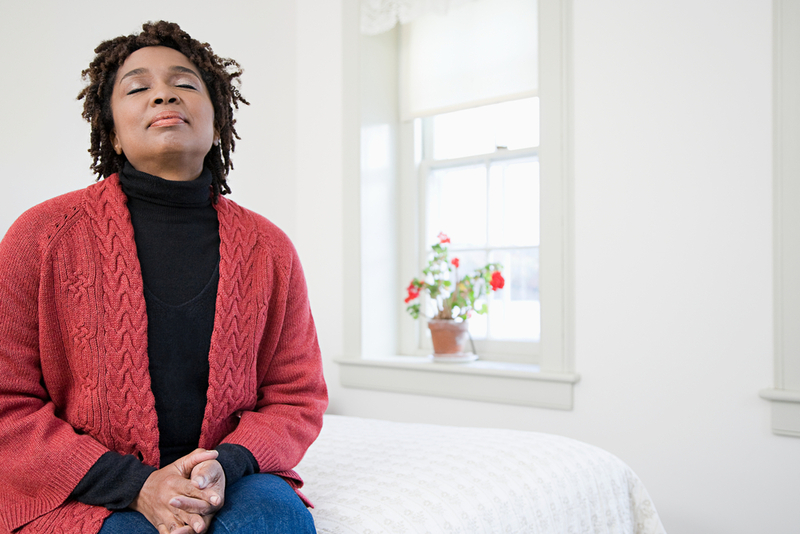 The three-part breath fills the lungs to capacity – something people just don’t do. We teach it as a brief group exercise suitable to begin any meeting. Bhastrika Pranayama, or “bellows breath” is energizing practice that opens the flow of internal energy upward and stimulates the body in many ways. Bhastrika is especially valuable during the challenging hours of mid-afternoon, and when following a sub-energizing lunch. Alternate nostril breathing, or “Nadi Sodhana” is a near silent technique of alternating breaths between the nostrils. Nadi Sodhana creates a greater sense of physical and mental balance – particularly useful after a brisk debate or difficult decision. While it might seem odd for a group of people in a room or conference call to take a 2 minute breathing break, groups that adopt the practice are stunned at the effect and at the subtle increase in positive team dynamic that builds over time. APP offers personal and group training in these practice areas as well as on-going support and coaching. Click here for free tools! While "balance" is a mindset and a practice rather than a goal or a condition, there are some solid, practical things in a HBR article to increase resilience and reduce burnout - and a few things to watch for. If you want to increase your own and your team's ability to manage challenge over time, try what's in that article, but also practice these three things. Yes, meditation. Mindfulness meditation is the buzz these days because of its proven effects of reducing stress levels and improving health outcomes - but not just sitting with crossed legs, closed eyes, and mudra-hands (though that, too). Meditation practices come in many forms - the pause before the meeting starts, the undisturbed walk around the building, paying attention to what's for lunch, and also sitting at a desk, back to the glass door, following a 7 minute guided meditation from your smart phone. Having taught meditation to employees and executives alike, I'm certain that no one practice works for everyone. But I'm also certain that there is at least one practice for anyone. Strategy 1: Develop your own mindfulness meditation practice that works at work and practice it. Bring in someone who can teach some simple practices to your team and, more than anything else, practice the practice. I was amazed and aghast at a recent HBR article. 54% of American employees didn't take all of their earned time off last year. Why not? Fear for one reason. Fear of being seen as replaceable or not necessary. Another reason? Being the "ideal worker." Ideal workers consistently put the company ahead of themselves - and do get benefits from it. Ideal workers are relied on and tasked more than others, meaning they get more opportunities and rewards than others. This can apply to vacations or off-hours availability. To some degree, this is a matter of wiring more than programming, but whether it's fear or ambition, most people who don't recharge - however they would choose to - inevitably burn out. The irony is that the failure to be present to life outside of work makes it impossible to be present to life inside of work - presence doesn't do "boundaries." However, insisting that team members be present to their non-work activities can be tricky. The keystone to that arch is you. If you are always available, always call-in from the soccer match, always promptly reply to emails from vacation, your expectation is clear, even if your message says otherwise. Strategy 2: The first HBR article title above includes the words, "Even when you can't." Make no mistake - if you can't, they won't. This is the discipline of no - and it begins with you. Practice being present to whom you're with and to what you're doing away from work. One of the most valuable leadership lessons I learned from martial arts and yoga was how to breathe - it has stood me well in situations worthy of (and sometimes actually in) business magazines. While we're not teaching our CEO or business clients punching or headstands, we are focusing on breath practices for focusing, energizing, and relaxing. Developing individual and group breath practices are one of the simplest yet most grounding things a team can do to manage debates, decisions, and even discipline. "Let's all just take a breath," is something we say when the going gets rough, but ironically it's not something we do - at least not well. Learning a practice like breathing together is a great way to increase familiarity and empathy - proven building blocks for effective teams. Strategy 3: You're breathing anyway - optimize it. Learn and practice up to three classic yoga breathes, share them with your team, and practice them together to settle into meetings, manage tension, and build energy. Free tools! Even if what's in this article is medical science (it is), it's not rocket science. What you need to learn about these three practices you either already know or can easily learn. If you are concerned that you or your team are` at or above capacity and it's all on you to deal with it, the good news is yes, you can. Get some help if you need it, but do it.